Hey old friend, wanna play ball with me? Clip a leash on your dog and go outside. If there are other dogs in your neighborhood that walk by with their owners, sit in an area where your dog can see them, but they do not approach him. This area can be the top of a set of steps or a bench that is not on the main dog-walking pathway. Each time he sees another dog, praise and pet your dog. Get his undivided attention on you and talk to him while giving him treats. When he is looking at you, he is not as worried about others. Re-introduce your pet to a dog he already knows and likes. Have the other pet owner meet you in a public place so it is not the private territory of either dog. Watch your dog for signs of fearfulness and retreat from others if he is scared. Slowly introduce him to his friend, reassuring him with gentle words and treats. Have the other dog owner do the same with his dog. Allow your dog and his pooch friend to touch noses and interact with each other if your dog is not fearful. Pay attention to his actions closely so he does not snap out of fear. Take your dog to a dog park and sit on the bench outside the entrance. Have your dog sit near you on a very short leash with just slight slack in it. Allow him to look at dogs entering and exiting while praising him and giving him treats. If the previous attack was at a dog park, visit a different one so he does not encounter the same dog. 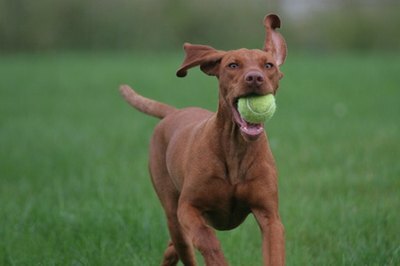 Enter the dog park with your dog and go to an area with fewer dogs. Constantly pet and praise your pup for being calm. Do this for several days until your dog is calm and will lie by you on the ground or walk on his leash without fear of others. In time, he will return to normalcy and want to interact with others as he did before the attack. If any aggressiveness shows in your dog as a response to fear, do not let him near other dogs, but pull him closer to you. Tell the other owners you are re-socializing him after an attack. Other dog owners are usually very understanding of the situation. Giving your dog lots of attention and treats around other dogs makes it a comforting and rewarding situation to encounter other dogs. For the best results, start re-socialization of your pet after an attack as soon as he is well. He may display signs of inter-dog fear aggression and strike out to others.